As ocean liners were becoming very popular and the world waited in anticipation as the much publicized WSL vessels were being built, some companies put out generic ads. This 3" long 1910 Canadian silk card SC12, is one such example. They were placed in such things as packs of tobacco. Although no words other than "Ocean Liner" is shown, the picture has a strong resemblance to a White Star Line ship as well as a bow flag clearly showing a star in the middle. A 1938 Italian Liebig Guglielmo Marconi card. 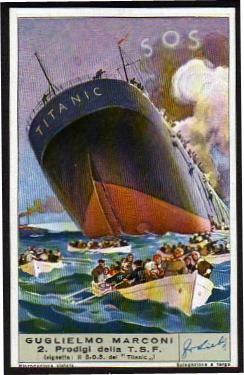 The Marconi wireless telegraph was used on the Titanic. This was the devise used to put out the distress signal as shown in the picture. Card #465 from the series, Heroes of the Sea. The card measures 2 3/4" x 2 5/8" , printed in 1939 by W.S. Publishing of New York City. 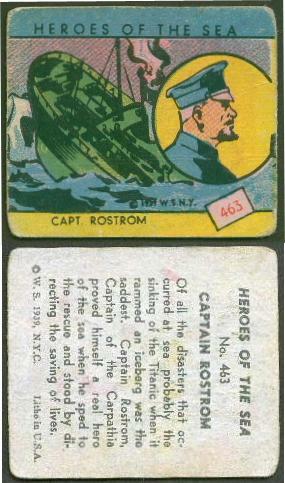 It features the Captain Arthur Rostrom, who commanded the Cunarder, Carpathia, the ship that rescued Titanic's survivors. Previously part famed Titanic collector the late Ken Schultz's collection.